These are made in a "nose-bag" shape, reminiscent of days-gone-by and horses' nose-bags. A more relaxed bag to throw over your shoulder. Will also accommodate a folder to use in school or college to brighten up your day! 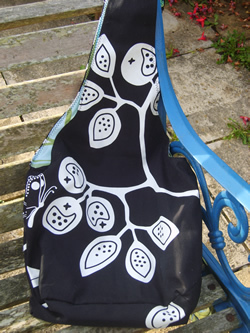 All "nose-bags" are £25 each. For ideas on different fabrics have a look at my shoulder bags and email me with your preference. As each item is individually handmade there may be a slight variation from the image displayed, this depends on the cut of the fabric.